As part of the East Side Culture Crawl, Strange Fellows Brewing is hosting a printmaking workshop. Some may or may not know that all of Strange Fellows’ brand imagery begins as hand-carved block prints. 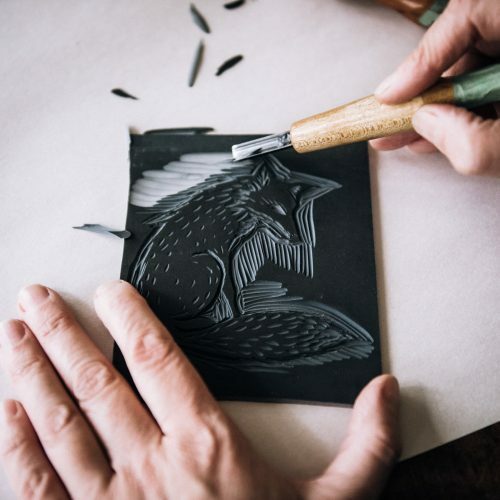 In the spirit of the East Side Culture Crawl’s goal to expose folks to artistic processes, Strange Fellows’ house artist Christine Moulson will show participants how to make a block print. For kids it will be a simple relief printing technique using foam and no sharp tools, while older kids and adults will be shown how to make a linocut print. Take a break from crawling, come by and grab a beer and make some art of your own! Workshop: November 18th & 19th from 1-4pm each day, in the Charles Clark Gallery. Limited space – first come, first served.